With its expansive windows and waterfront location, the great room’s professional kitchen, dining and living room are great places for coming together to share meals and conversation. They also provide the community with highly desirable indoor outdoor living and dining options, including a private patio with views of the adjacent waterway. 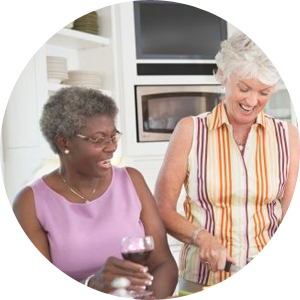 Whether residents are cooking together or working along side their professional chef, meals are always a great time to gather and enjoy the company of others. Phoenix Commons is designed to take full advantage of community living on the waterfront. Large glass doors in the Great Room lead to the waterfront patio and adjacent boardwalk that runs along the estuary. It’s a great place to walk or simply sit and take in the view and neighborhood activity. Each floor of the building provides outdoor spaces that encourage and support community life. These include rooms specifically designed for group get-togethers as well as large patios where neighbors might enjoy a spontaneous conversation or cup of coffee. The first floor atrium will certainly give gardening lovers an opportunity to enhance the beauty of this and other landscaped areas in and around the community. In addition, there are spaces available that can be used for spa, therapy and fitness activities depending upon community interests and needs. There are two additional flexible community spaces available for a variety of possible uses. These areas might be transformed into an art studio, workshop, library, theater/media room, conference room or playroom for grandchildren. The building has common space available for any of these uses and more. It will be up to the community to decide together what kinds of common activity spaces will serve them best. An office space is provided to support the community’s business related activities. The office will provide a place for the fax, copier, computers, file cabinets and other business related equipment and storage. There will also be space available for three to four workstations. This bonus apartment at Phoenix Commons provides the community with options. It’s nice to know that friends or relatives can have a place to stay when they visit. However, in the future, the community may choose to have live-in caregivers. Either way, these additional living quarters allow for flexibility as the community’s needs evolve and change over time. Ground floor private parking keeps residents and their vehicles safe. Electric car hookups and space allotted for a Share Car allow for economical transportation options; while a bicycle storage area encourages residents to stay active and reduce the carbon footprint. The architect’s design for Phoenix Commons utilizes eco-friendly technology. It maximizes resident comfort both economically and with respect for environmental sustainability. The universally designed private and shared spaces all support aging in place. Residents can feel confident about remaining active and comfortable in their homes, and community, as the years go by. Click here to find out more about our green building and sustainability. Please click here to see floor plans and renderings that highlight the various community areas in the building.